Katrina Craig, CEO, welcomed all – many of the global team had travelled far to be there – and gave an overview of business in 2018, together with a summary of a healthy pipeline as we start 2019. Alex Mavridis, COO EMEA Team, reported on HSP’s global structure and business model as we seek to forge alliances and relationships across the globe. David White, VP Finance, provided a financial analysis to date and consultants Jon Barker and Duncan MacArthur presented case studies on recent projects they had led to the team. 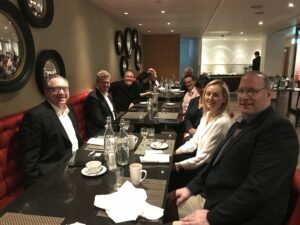 We were delighted to be joined by a number of clients and partners for lunch, before David Atkinson VP Business Development, gave a presentation on the partnership’s extensive sales and marketing strategy, specifically drawing on HSP’s representation at international trade shows such as the IHIF in Berlin in March, and the ATM in Dubai in April. It’s always nice for the team to get together to brainstorm and share news on views on current industry trends and our 2018 conference was a forum for our experts to discuss the impact Britain’s forthcoming exit from the European Union will have in our markets. 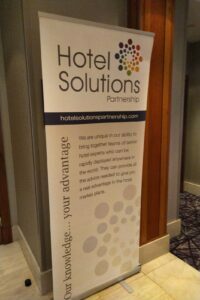 2019 – a year of change and Hotel Solutions Partnership are looking forward to new challenges!